Everyone’s favorite puffin is back, and guess what—he’s still ANGRY! When Puffin is offered a muffin, he realizes that he's the subject of another picture book and the target of a rhyming scheme gone wrong. His emotions take over and chaos ensues as he tries to escape the story line. Luckily, Puffin knows just where to turn for help. See what happens when characters from other picture books come to Puffin's rescue. Timothy Young fans will have fun spotting characters and scenes from his previously published books, as well as references to other children's classics. Will Puffin get lost in the fantasy worlds, or will he find his way out? 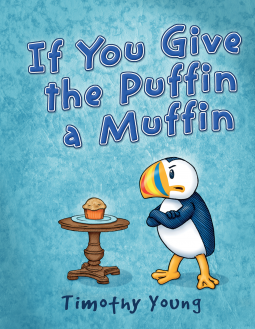 If You Give the Puffin a Muffin is an entertaining children's book about a very meta puffin. Yes, I said meta. You see, Puffin knows he's in a book. He's also not very happy about being in the book, nor is he happy about being offered a muffin, no matter how delicious it is. Puffins don't eat muffins. That's just silly. Follow Puffin as he tries to escape the book (and the muffin), all the while offering other suggestions to the reader (and author) so he can be left alone. I found the story amusing, and my three year old son listened as I read it to him. He enjoyed the illustrations as we read. I think if he were a little older, he might've laughed along with me, but, alas, he is just beginning his reading journey. I suppose the story may not be to everyone's taste, but I thoroughly enjoyed how fussy Puffin was, and how he snarked to the reader as the story went on. It was definitely a unique children's book, and I think parents will either really like it or find it perhaps a bit off-putting for their child. I guess it depends on the parent. Young readers might also find it to be a fun read. Some may question why Puffin is so angry, but others will enjoy it for what it is. I think If You Give the Puffin a Muffin deserves four stars from me. Timothy Young has worked as an animator, sculptor, toy designer, graphic designer, puppet maker & art director. He is very pleased to have fulfilled a childhood dream to write and illustrate his own picture books.